One of my main goals in writing is to discover and bring the ancient theology and doctrines of the early charismatic Christian church to the contemporary Charismatic Renewal Movement. There is a clear disconnect between the doxis of Western Latin Christianity and the praxis of the contemporary Charismatic Renewal Movement which operates in the gifts and fruit of the indwelling presence and power of the Holy Spirit. The Renewal Movement certainly has the basic praxis (how beliefs are practiced, embodied and realized in conduct) of the early charismatic Apostolic church, but does not have a corresponding supportive, complementary doxis (religious beliefs, worship, doctrines, and creeds) which explains and supports that praxis. The world needs to see lives transformed, but it also needs to know why and how they have been transformed. To do this, the world must see a complementary balance of belief and action at work. But, just as vital, the world must see something else in mutual support and balance: orthodoxy and orthopraxis– that is, right belief and right action. A key essential in an orthodoxy which supports a Renewal Movement (apostolic church) orthopraxis is an understanding of the Essence and Energies of God and the distinction between them. It is only in understanding Essence (transliterated ousía in Greek) and Energies (transliterated enérgeia in Greek) of God that we can reconcile the seeming paradox of the unknowable transcendence of God with the universal, yet very personal indwelling presence and power of God in all humankind. Throughout this discussion, I will rely heavily on the writings of 20th century theologians including Vladimir Lossky, Christos Yannaras, and Fr. John Meyendorff. They, in turn, refer to the authority of many early Church Fathers including St. Gregory of Nyssa, St. Gregory of Nazianzus, and St. Macarius the Great (all 4th century); St. Dionysius the Aeropagite (5th century); St. Maximus the Confessor (7th century); St. Symeon the New Theologian (11th century); and last, but not least, St. Gregory Pálamas (14th century). I make all of these citations so that the reader may understand that the theology and doctrines on the Essence and Energies of God are both ancient and continuously attested to throughout the Patristic literature up to this day. These citations also make it clear that none of what you are about to read is my original work or thoughts. In order to understand God’s essence, we have to spend a little time understanding how to approach an understanding of God! Since the writings of St. Dionysius the Areopagite in the 5th century (e.g., “Concerning Mystical Theology”), apophatic theology, or the via negativa, has enjoyed undisputed authority in the theological tradition of both the Christian East and West (Lossky). Eastern Christianity teaches that the essence, being, nature and substance (ousia) of God is uncreated and incomprehensible. Lossky finally summarizes all apophatic descriptions by defining God’s essence as “that which finds no existence or subsistence in another or any other thing”. In our discussion on God’s energies, I will rely heavily on the writings of the greatest expositor on the Essence and Energies of God, St. Gregory Pálamas (1296–1359). Palamas was a monk of Mount Athos in Greece and later the Archbishop of Thessaloniki. He is known as the preeminent theologian of Hesychasm (Greek: silence, stillness, or quietude), the ancient Christian tradition of contemplative prayer and theosis, or union with God, dating back to the 2nd century. In the 1330s and 1340s Palamas defended the theology and doctrine of Hesychasm against Barlaam the Calabrian, a theologian trained in Western Scholastic tradition of reason and logic, who attacked the doctrines and practices of the Hesychasts, accusing them of heresy and blasphemy. In response to Barlaam’s attacks, Palamas wrote nine treatises entitled “Triads For The Defense of Those Who Practice Sacred Quietude [Hesychasts]”. The treatises are called “triads” because they were organized as three sets of three treatises. Ultimately, Palamas prevailed and his theology was endorsed in a series of six patriarchal councils held in Constantinople between 1341 and 1351. Barlaam was anathematized, returned to Italy, and joined the Roman Catholic Church where is views received a more sympathetic reception. Most of what follows comes from Fr. John Meyendorff’s 1983 publication of St. Gregory Palamas’ “Triads”. “After the coming of Christ … God enters into immediate communion with humanity.” So, for Palamas the Incarnation of Christ, the Logos, the second Person of the Holy Trinity, is absolutely central. Indeed, true “deification” (theosis) became possible when, according to the expressions of St. Athanasius, “God became man in order that man might become God in him”. Greek patristic anthropology is theocentric. That means that the study of man begins in God. “At his creation, man was endowed with some “divine characteristics” in that he is God’s “image and likeness”. According to St. Maximus the Confessor, these characteristics are “being” and “eternity” (which God possesses by nature, but gives also to man), and earlier, St. Irenaeus of Lyons identified the “spirit” naturally belonging to man with the Holy Spirit. Consequently, man is not fully man unless he is in communion with God: He is “open upwards” and destined to share God’s fellowship” (Meyendorff). Man’s participation in God does not occur in the future, not in the “sweet by and by”, but now, here, in this life. 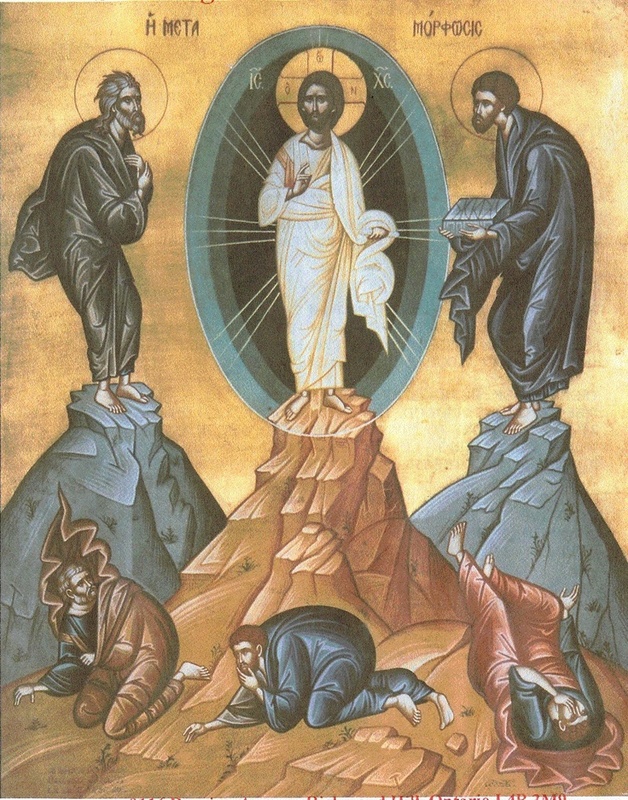 In the context of this affirmation of God’s real manifestation of his energies to creatures, Palamas, following Maximus the Confessor and John of Damascus, refers to the New Testament accounts and references to the Transfiguration of Christ on the mount (Mt. 17:1-9; Mk. 9:2-9;Lk. 9:28-36; 2 Pet. 1:17-21). This idea of “God as Light” recurs throughout Patristic literature including the aforementioned Maximus and John, plus the likes of Origen, Gregory of Nyssa, Dionysius the Areopagite, St. Symeon the New Theologian, and Gregory Palamas himself. Palamas was quick to point out the difference between any other light-experience and that of the vision of God as Light that appeared to the disciples during the Transfiguration on Mount Thabor and that, in Christ, has become accessible to the members of His Body, the Church. The following quote from Palamas (Triad I, 3, 38) uses the image of the illumination of the disciples by Christ on Mount Thabor to explain how we, in Christ, can be illuminated from within. An understanding of God’s energies allows humankind to experience God directly through a personal relationship with the Persons of the triadic Godhead; the divine persons in communion and relationship with humanity as persons. That aligns with and supports every human being achieving their purpose in life; having been created in the image of God, to attain to His likeness, partaking of the divine nature, in this life. Without this theology of the Essence and Energies of God, the praxis of the Renewal Movement, the indwelling presence and power of God in intimate personal relationship within us, is left with no complementary supporting theology or doctrine. It is left without its complementary, supporting doxis. We are left with a religion with a split personality, with no continuity between its belief and action; its doxis and praxis. You will note that the Western Latin (Roman Catholic and Protestant) Church, embodied in the person of Barlaam of Calabria, does not recognize the Essence-Energies doctrine. Hence, Western theology and doctrine have no means of explaining and dealing with the transcendence of God and with the simultaneous indwelling presence and power of the Holy Spirit which animates Renewal Movement Christians. The West has no orthodoxis which complements and supports a spirit-filled orthopraxis. This orthodoxis is only found in the Eastern Orthodox tradition.